Consumers prefer the low power and less water consumption and optimal energy efficiency. Many customer reviews and ratings decide the top washers as follows. 1. Whirlpool WFW94HEXW ENERGY STAR Qualified Duet 4.3 cu. ft. Capacity I.E.C. 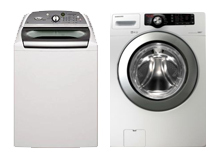 Equivalent Front Load Washer, 10 Automatic Cycles, 6th Sense Technology, LED Display. 2. Whirlpool WFW95HEXW ENERGY STAR Qualified Duet 4.3 cu. ft. Capacity I.E.C. Equivalent Front Load Washer, 10 Automatic Cycles, 6th Sense Technology, Deep Clean Steam Option, LED Display. 3. Samsung Appliance WA5451ANW 4.7 Cu. Ft. Top-Load ENERGY STAR Washer with PureCycle, Direct Drive Motor, 1100 RPM Maximum Spin Speed and Internal Water Heater. 4. Maytag MHW6000XW 4.3 Cu. Ft. Capacity DOE Front Load Washer, Advanced Vibration Control Plus Technology, 1400 RPM, IntelliFill Auto Levels, Energy Star Qualified.